← BNO 7 nov 19.00? Hoa Vien Brewery: Lots of people this night. Former BNO guys showed up. Ribs tasted good and ok service. 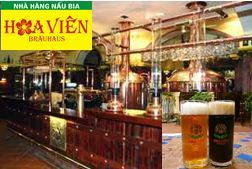 We drank mostly the special beer which had a good taste, but 90 000 VND for 1 liter of beer, they have the dark, the lager and the special one. Hoa Vien has many pubs in Hanoi but this is so far the better one.